Of course, it is some time since we last communicated (twenty years or there abouts?) And my feelings for you have not really changed in that time - a mixture of disgust and loathing. It is not all directed at you, your jazz' brother Jo deserves the same - also a number of our relatives, Uncle Alfred and his sick Society of Rosenbergs, for starters. Jesus, what a pervert - all those young girls. It makes me very angry indeed. Anyway, this letter is about none of that. I was in the Rue Saint Denis yesterday and who should I meet but my cousin Janis. She told me, in that breathless style of hers, that some Australian publisher was putting out a book about our family and that I wasn't in it! You total slimeball! 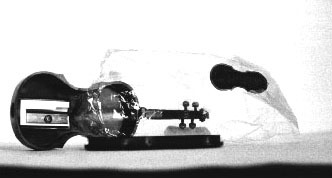 If it wasn't for me, you would never have taken up the violin in the first place - the only thing you ever wanted to do, as a kid, was play with your wretched train set. Oh God, there are times when my longing for you overwhelms me - do you remember those Sunday mornings when Mamma and Poppa were at church? Anyway I'm not going to bring that up now. I mean you really are a ratbag. You could have included me in this book, at least my treatise Violin - An Instrument of Sexual Repression' and some of my duets for violin and harp. (That's if you haven't already appropriated my compositions under your own name which has happened in the past, has it not?) You know, the only positive thing about the Rosenbergs is the courage shown by the women in the family fighting you bunch of patriarchal dogs. I have always felt used and degraded by your sexual conduct. You just played with my family loyalty and more - because you knew that I loved you, you always assumed that I would keep my mouth shut. Well, not any more. This is a warning. I have been making a dossier on you (I'm not going to bother with Jo and poor Jimmi as history will bury them anyway very quickly), but if this Australian book has any inaccuracies, lies or deceptions, I'm going to take you to the cleaners. I'm not joking, Doc! I know a lawyer here in Paris who is a specialist in this kind of thing. We'll do you good and proper. Honest we will. 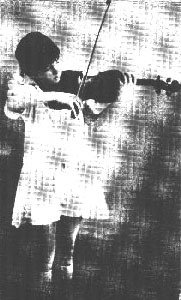 A rare reproduction of infant violin prodigy Judy Rosenberg.